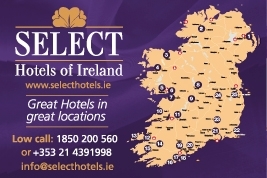 Select Hotels of Ireland is a collection of 3 and 4 star independent Irish Hotels, all with a strong tradition in Irish hospitality, quality luxuryaccommodation and excellent service. Select Hotels are based across the island of Ireland, in key destinations such as Dublin, Kerry, Kilkenny, Galway, Belfast, Cork and many more. Many of our Hotels are run by the same family for generations, some Hotels have long histories as landmark Hotels in Ireland, some modern Hotels with state of the art facilities, many overlooking breath-taking scenery, all with wonderful Irish food, but most importantly all with a warm Irish welcome that is synonymous with Ireland. Regardless of the length of stay, whether it's for a short break or a longer holiday, for spa breaks or for family holidays in Ireland, for actively retired groups, for a golfing holiday> or activity breaks, to view Irelands sites or to enjoy the atmosphere of a good Irish pub; our dedicated team at Select Hotels will put together a package or tour to suit you. Our team are delighted to help with Select gift vouchers for your loved ones, handle all bookings and requests for our wonderful Select Hotels to suit any customer requirements. There are many reasons to stay with our hotels in Ireland; and here we give you the top five reasons to book Select Hotels of Ireland. We make it easier for you to book 26 of the best independent Hotels in Ireland, using one point of contact to deal with all requirements, at the Hotels best available rates.